I want to tell you a remarkable story about a freshman named Kim. But first let me just say how thankful we are for you. Because of you students here in Boston get to know Jesus Christ. Thank you for your prayers for Brian and me and for our ministry with Campus Crusade for Christ. I first heard about Kim from her roommate Monica who is one of our student leaders at Boston University. Monica wanted to invite her to something spiritual but didn’t know how to because Kim was very clear that she was Atheist. We chatted about how she might invite Kim to our first event of the year. The next thing I knew, Kim was sitting in a life group that I lead on Monday nights. Kim is really funny and has lots of energy. She also has a pretty hard story. She grew up with a Father who has been addicted to heroin her entire life. As a result she began to shut down. By the time she entered college she was struggling with a very serious eating disorder and was personally struggling with using drugs and guys to cope. Fast forward a semester. She quit school, moved home to get some help, and transferred to BU this fall to finish out her freshman year. I think meeting nice people is great but I really was praying that she would see Jesus for who He really is. 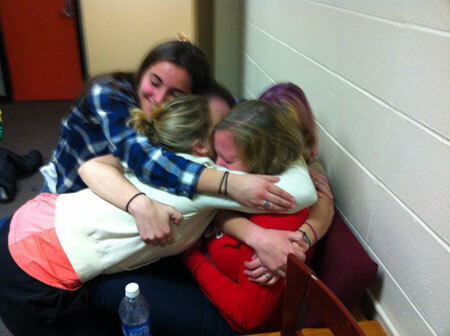 Here are some of the girls in my Monday life group embracing Kim after she shared her story. Last week, Kim sent a text message before life group and asked if she could share her story with all of us because she was worried about being a hypocrite. As she shared the brokenness of her story many started to cry. Then she started to talk about the last 10 weeks. She talked about how she had totally pushed the idea of God away, out of her life before coming to Life group. However, it was in the past few weeks that she has begun to see that God loves her and that He actually does exist. Kim is so faithful to show up every Monday night. She is faithful to be honest about what she really thinks. She is in process, but I am so confident that Jesus is drawing her to Himself.